Candice in West Midlands, England, in June 2013. 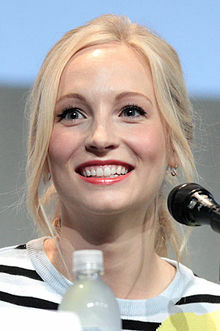 Candice Accola (May 13, 1987) is an American actress, singer and songwriter. She appears mostly on television. She acted as Caroline in The Vampire Diaries. Accola is a supporter of the It Gets Better Project, which aims to prevent suicide among LGBT youth. ↑ Johnson, Zach (May 29, 2013). "Candice Accola Engaged to Joseph King: See Her Diamond Ring!". Us Weekly. ↑ Parker-Pope, Tara (September 22, 2010). "Showing Gay Teens a Happy Future". The New York Times. This page was last changed on 10 April 2016, at 22:15.